"Juntos/Together" is a 6 foot by 17 foot freestanding wall with a mosaic mural on each side. 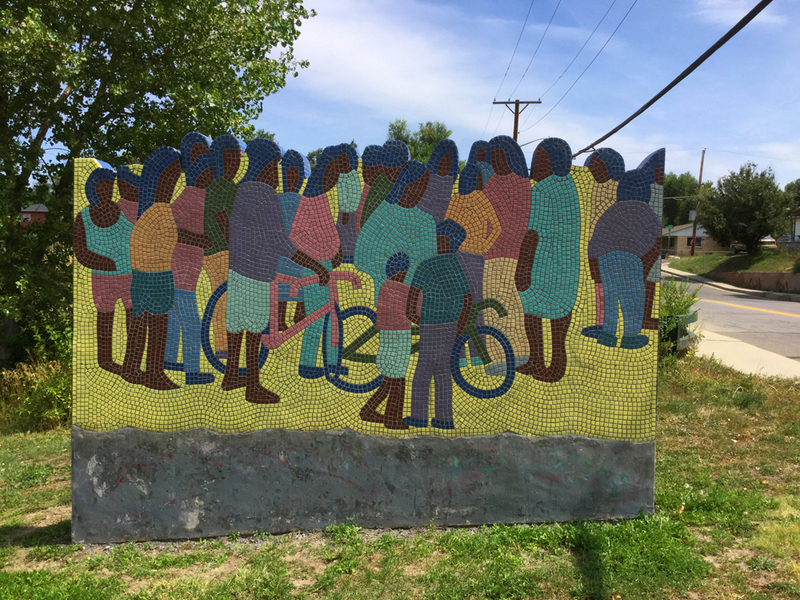 The mural brings a human element to the Lakewood Dry Gulch Park, depicting groups of people interacting and enjoying the outdoors. "Northpark" public art piece is very unique and unlike any other public art project in Denver's collection. Tony Ortega and Maureen Auman presented their concept in response to a request for a writing artist and a visual artist team to facilitate 1350 students in leaving their personal mark in their neighborhood.The artists worked with students in the elementary schools to elicit phrases and drawings, which are sandblasted intoexisting concrete structures incorporated into the park design. The artist Tony Ortega is bilingual and worked with students in both English and Spanish. The piece is left in the park in both languages.